Visit www.oceanbus.se/en/tickets-timetable to make your reservation for the ride. Your ticket must be redeemed at Strömgatan before entering the amphibious bus. Collection Information Visit www.oceanbus.se/en/tickets-timetable to make your reservation for the ride Ticket must be redeemed at Strömgatan before entering the amphibious bus. 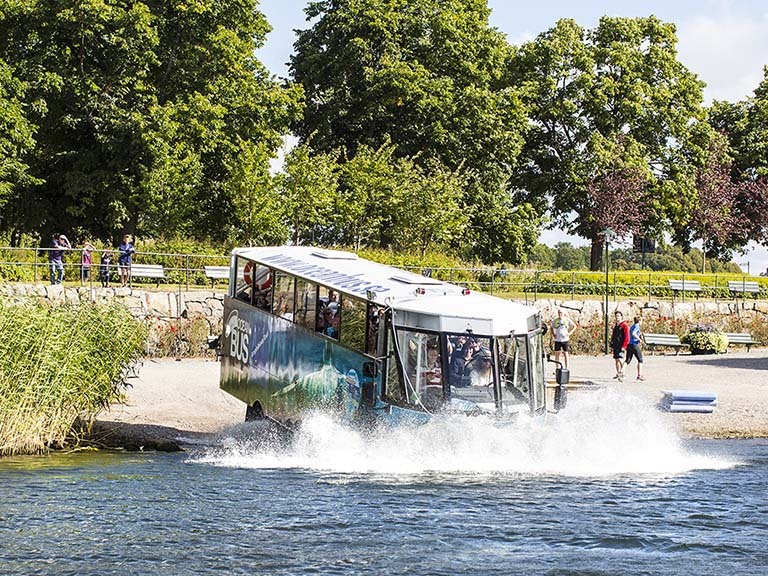 "Experience Stockholm from both land and water in one single vehicle - an amphibious bus! You will get see many of city´s most known attractions whilst our guide tells fun and interesting stories along the way. Experience the thrill when we drive a 10 ton bus into the water. The tour start on land at Stromgatan - close to the Royal Opera. Welcome aboard the Ocean Bus - Sightseeing with a Twist"
The amphibious Ocean Bus Stockholm is the only vehicle that can show you Stockholm from land and on water, all in one experience. Don’t forget to look up as the bus drives into the ice cold water of the Baltic sea. On Ocean Bus Stockholm you get to cruise along Stockholm’s most exclusive boulevard, Strandvägen, continue through the shopping and nightlife area of the city, also known as Norrmalm. Pass the Diplomat Town, home to ambassadors in Sweden and some of the most expensive houses in Stockholm. Hang on tight as we drive a 10-ton bus straight into the Baltic Sea and continue from there. The fish better watch out, as we jaunt through the harbor of Stockholm. What does green Djurgården look like from a canal, the square Royal Palace from below and the colorful Vasa Museum from afar? Take a chance and find out!